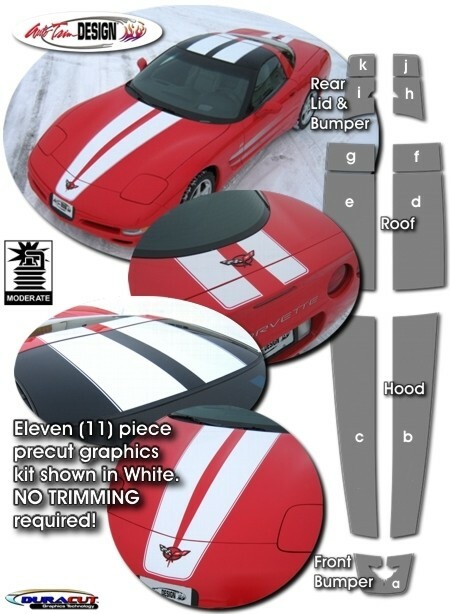 Make your '97-'04 Chevrolet Corvette C5 Z06 "Tough-looking" with this Bumper, Hood, Roof and Rear Deck Lid Rally Stripe Graphics kit. Z06 kit come with eleven (11) pieces. They're PRECUT and ready to install here in Gloss Black - there is NO TRIMMING required! Stripe width is approximately 10" (25.40cm) and set for a center spacing of 4" while a .25" (.64 cm) pinstripe borders the outside edge as shown.